Fans usually have to wait months after a movie's release in theaters to check out the deleted scenes on the Blu-ray and DVD. But today, Batman v Superman: Dawn of Justice fans are getting a surprise treat. The official Warner Bros. YouTube page has posted a new video entitled Communion, which is a deleted scene from Batman v Superman: Dawn of Justice that showcases more of Jesse Eisenberg as Lex Luthor. While this scene shows how this villain was finally apprehended, it also raises new questions as well. If you haven't seen Batman v Superman: Dawn of Justice yet, there will be SPOILERS below, so read on at your own risk. In the theatrical cut, we see Lex entering the crashed Kryptonian ship where he starts to create Doomsday. But we don't see him again until after he is eventually apprehended and thrown in prison. This scene showcases a number of soldiers entering the crashed Kryptonian ship where Lex Luthor had set up shop to create Doomsday. We see these soldiers advance on Lex, who is using the Kryptonian technology to create some sort of creature, who is seen holding what appear to be Mother Boxes. This technology from Darkseid's Apokolips is also used to turn Victor Stone (Ray Fisher) into Cyborg. It's possible that this creature is actually one of the New Gods, with some speculating that it could be Steppenwolf. Steppenwolf was created by Jack Kirby, debuting in the 1972 comic New Gods #7. Steppenwolf was one of highest-ranking generals on the planet of Apokolips, and he was actually an uncle to the nefarious Darkseid, as well as his mentor. 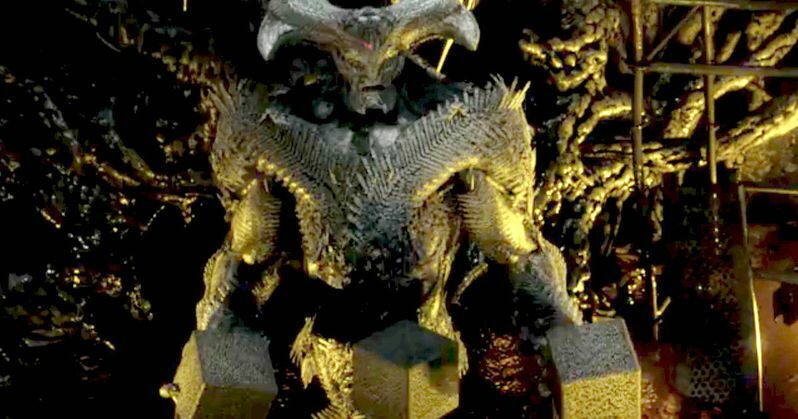 It hasn't been confirmed if this mystery creature is actually Steppenwolf, or if we'll see more of him in Justice League Part 1, which starts production next month in the U.K. If it is Steppenwolf, though, it could open up some interesting avenues for the DCEU to explore. Of course, Lex is eventually apprehended, so we don't know what his plans for this creature may be, or how he may or may not fit into the upcoming Justice League Part 1. It's possible that this creature could be a crude version of the iconic villain Darkseid himself, whose presence was teased in Batman v Superman: Dawn of Justice during one of Bruce Wayne's nightmares, where he sees a destroyed landscape with Darkseid's Omega symbol implanted in the ground. Perhaps there will be another deleted scene on the Blu-ray and DVD release that will give this mysterious sequence more context. Last week, we reported that Batman v Superman: Dawn of Justice will be getting an R-rated Ultimate Edition, which will be released on July 16 and can already be pre-ordered on Amazon. We don't have many specific details for the R-rated cut yet, but director Zack Snyder recently confirmed that fans will get to see more of Jimmy Olsen. This character was played by Michael Cassidy, although he was killed off rather quickly after it was discovered that he was a CIA agent, while on assignment with Lois Lane (Amy Adams) in Africa. It definitely isn't a common practice of studios to release deleted scenes just days after a huge movie like Batman v Superman: Dawn of Justice is released in theaters, but perhaps Warner Bros. is trying to shake things up a bit. We don't know if the studio intends to release more previously-unseen footage or not, but we'll have to wait and see. While we wait for more on the R-rated Ultimate Edition, check out this deleted scene below, featuring Lex Luthor.